Are there other @LibDems like me who, while recognising that it is the job of the opposition to oppose loudly, think this is a good budget? This led to a long discussion with Peter in which we found little common ground on the measures set out by the Chancellor yesterday. He viewed the Budget, in its entirety, as “relatively balanced“, and even as evidence that “the Lib Dems have had a lasting effect on George Osborne“. If you hadn’t guessed from the title of this post, I vehemently disagree with Peter’s view. My central point in our discussion was that Osborne’s brilliance involves shifting the political centre to the right, through appropriating previously left-wing policies such as the “living wage” to suit his own ends. When you consider that Osborne and Cameron gained their initial political colours during the period when Tony Blair was in the ascendant, this becomes unsurprising: they are merely doing what he did, but the other way round, and arguably more successfully. Of course, they also have it easier, because Blair’s political strategy was based on using market mechanisms to reform public services. In purely economic terms, he didn’t even begin to challenge Thatcherite laissez-faire mores. So when the Tories came to power in 2010, they had little to unravel from that perspective – and they also had the perfect excuse (a massive financial crisis and an unsustainable deficit) to begin to reshape the size and role of the state as they wished. Now Osborne can take that one stage further without the Liberal Democrats to restrain his more extreme ambitions. His goal is to create a new political economy: one in which the state is no longer involved in attempting to solve material and social inequality of outcome or, indeed, opportunity. The “high wage” aspect is a smokescreen. No government can raise wages simply by saying so, and the impact of the change is, by confusing the mandate of the Low Pay Commission, to politicise a system that previously worked well. The Office of Budget Responsibility is also clear in its analysis that the “national living wage” will create more unemployment, and will cost the economy money. Given that this is the only policy in the Budget that attempts to create “high wages” – we can chalk it up as a failure. What about low tax? Well, it’s now clear that this Budget is a net revenue raiser, with £25 billion of tax cuts playing off against £47 billion of tax increases. So purely on that alone, he has failed. Moreover, the tax cuts he did announce were focused on the top end of the income and wealth distribution. Obviously the inheritance tax cut only benefits those who are sitting (or more accurately whose parents are sitting) on high-value estates. But the increase to the 40% income tax threshold also only benefits those who earn more than £43,000, while it is understood these days that increases to the basic income tax threshold also disproportionately benefit those on higher incomes. No, in actual fact, the only portion of Osborne’s mantra that was successfully implemented was the “low welfare” bit. Here, it is true, the Chancellor has delivered in spades. The extent of the cuts and freezes to working-age benefits is breathtaking; more breathtaking still is how they are targeted on the poorest people in society, especially those in low-paid jobs. 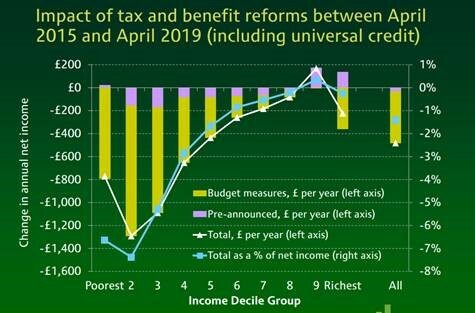 Here you can see not only that the poorest third of the population lose at least £800 per year, but that the ninth richest decile is actually enriched by this Budget. What’s the point of all this? It’s to show that the Chancellor has entirely failed to deliver a Budget consistent with his own stated aim – a “high wage, low tax, low welfare” economy. If he were serious about the first bit, he would have used yesterday’s statement to use the proceeds of higher taxation (or even of lower welfare) to put money behind upskilling the workforce. But he didn’t. If he were serious about the second bit, he wouldn’t have raised an extra £47 billion by disproportionately penalising small businesses through changes to dividend taxation, or by absurdly forcing a carbon tax on companies that buy renewable energy. The only serious bit was the third bit, and that is because his central political aim is to strip away the support that keeps poor people afloat. The genius of the Chancellor is to use sweeteners and carefully crafted soundbites to appear reasonable, even centrist. Yesterday was perhaps his most successful attempt yet. Aided and abetted by a supine media and an opposition that isn’t there, he is using the Conservatives’ new political capital to carry forward at a far greater speed his vision for Britain. It is a country gripped by greed, selfishness and suspicion. It is a country where the poorest are expected to fend for themselves and where the wealthiest are enabled and encouraged to hoard their riches. 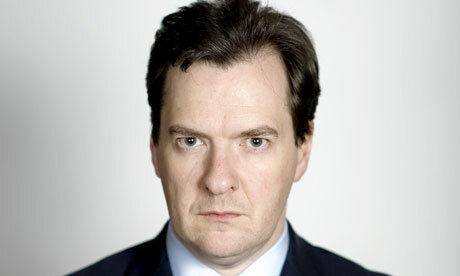 The most worrying aspect for the Liberal Democrats about all of this is that we are in no position to oppose Osborne. It is only now, after our electoral destruction, that the full scale of our strategic failure in government is becoming apparent. As Stephen Tall’s excellent but depressing blog today suggests, if our party were still in Coalition, we’d have cheered this Budget. And, terrifyingly, George Osborne knows it.